The My Resources Module has undergone significant development so that it can be used as a central storage point for documents, files, video etc. All resources are now uploaded into a specific Category and access to these is set based on the Category that is assigned to you as part of your Role/s. In line with the updates to the My Resources Module, Event Form Attachments (Attachments uploaded to Event Forms, NOT File Uploads within the document) have also undergone significant redevelopment. Now EACH Event Form can be set up on an Event Form by Event Form basis so that Attachments are treated as an Attachment AND as a Resource as well. This change will enhance your ability to access and locate attachments that you have access to. It has to be set up specifically by your system Builder. N.B. Your ability to access specific Resources and Attachments from Event Forms that treat Attachments as Resources is now set by your system Administrator. If you do not have access to the correct information or Categories, please contact your organisation's Site Administrator immediately. 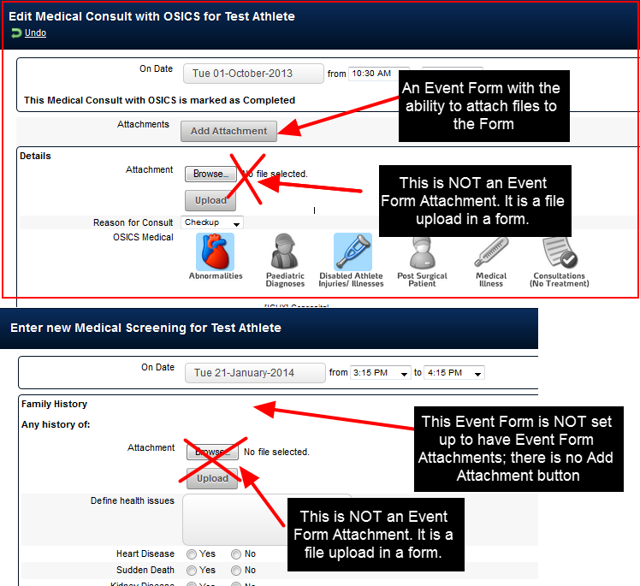 Previously, there was no way to limit whether an Event Form Attachment should be accessible to all users who have access to the Event Form and the Athlete. Furthermore, there was no way to search through any attachments using any descriptive information. Attachments were only displayed in the order of upload, and they could only be opened from the Sidebar, or from the Event Form or Athlete History. 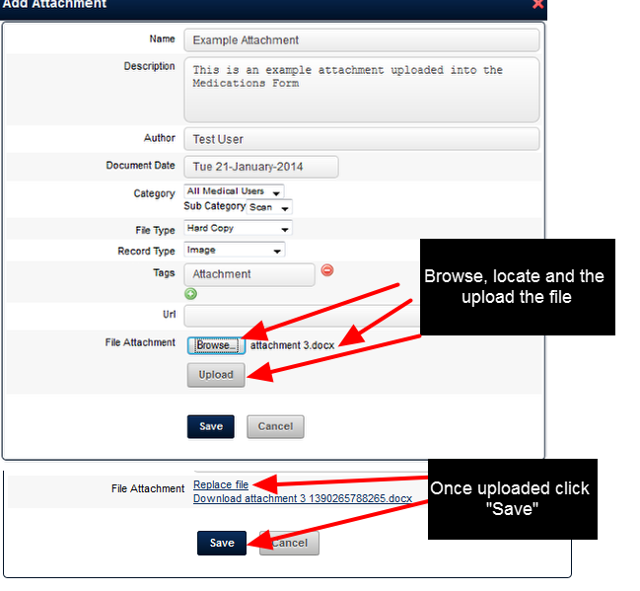 Now when you upload an Attachment-Resource it MUST be added into a Category (as shown in the image in the step below). This defines where it is stored and who can have access to it. 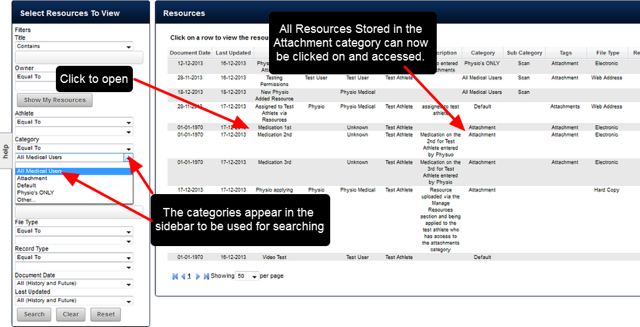 Moreover, the attachments Resources also becomes searchable via the My Resources Module. Currently when you attach a file to an Event Form that is just set up with Attachments, the following fields appear. All of the Event Forms on your system need to be set up to have Attachments, or to have Attachments as Resources. 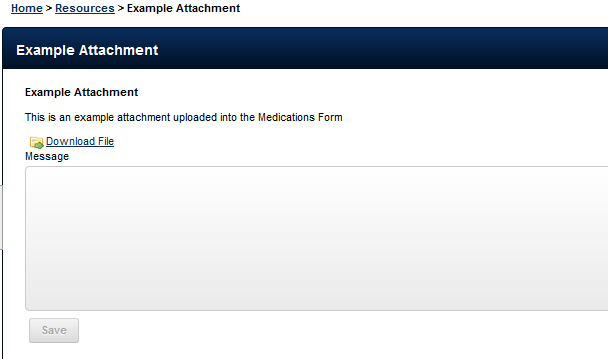 The image here shows an attachments being added to an Event Form that is NOT set up to treat Attachments as Resources. Many of the forms in your system may be set up this way. They do NOT need a category to be set, and they can continue to be accessed by anyone with access to the Event Form and the Athlete. For Event Forms that are set up to treat Attachments as Resources, when you upload an Attachment-Resource you now add it into a Category. This is predefined list that was set up by your site administrator. Adding an attachment into a specific category helps to restrict access to it, and to enhance searching for it on the My Resources Module. Furthermore, additional descriptive information such as the type of file, subcategory etc increase a user's ability to search for and access each attachment on the My Resources Module. The steps to upload a new Attachment-Resource are outlined below. The Date it was uploaded, the person who entered it, and who is was entered for, will also be available to use as search parameters in the My Resources Module. 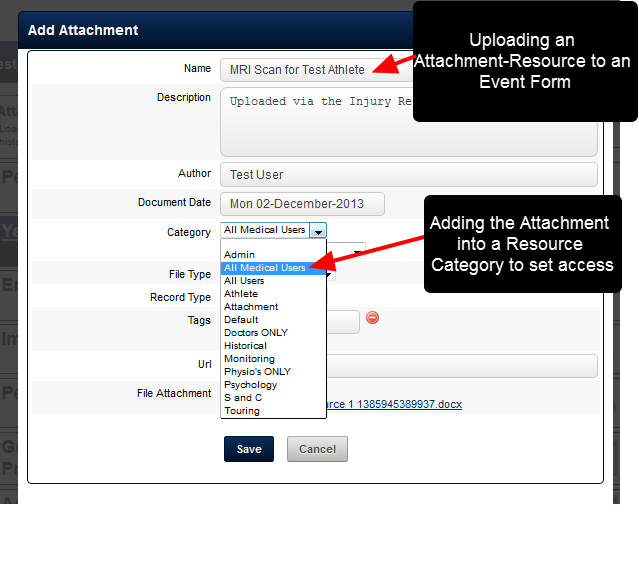 To enable you to continue to access all of the existing attachments that have been uploaded into Event Forms that are reset to treat Attachments as Resources, all existing Attachments uploaded to the Event Form that is changed will instantly be categorised into a Category called "Attachment" (as shown in the step below). 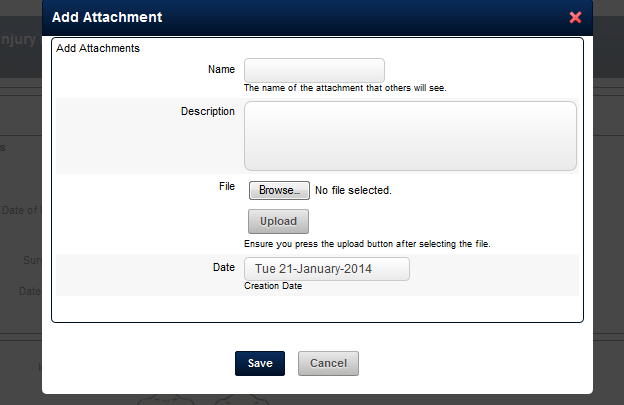 When you open an existing Event Form Attachment it will be categorised into the "Attachment" Category. 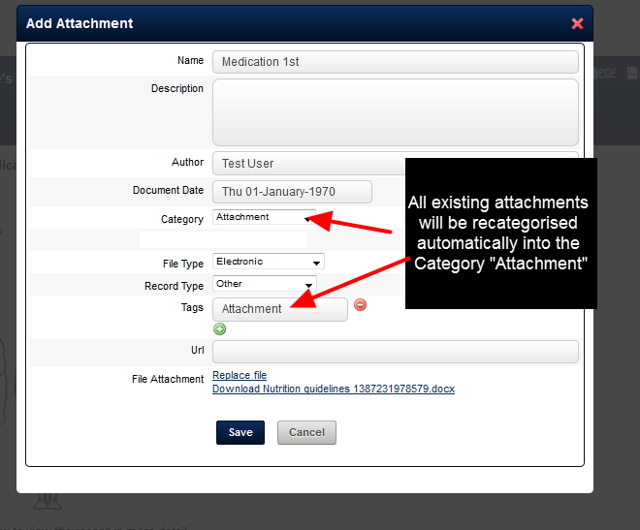 The example here shows an existing attachments that is now automatically categorised into the "Attachment" Category. All historical attachments for each Event Form that are updated to Attachments as Resources will now be stored in the "Attachments" Category. These attachments still appear in the sidebar, and in the attachments list for the Event Form, but they ALSO now appear in the My Resources Module (the central document storage location). The same data protection measures exist on the My Resources module. ONLY users who can access the Event Form (e.g Injury Record), the specific athlete, and now the correct category will be able to access each attachment via the My Resources Module. 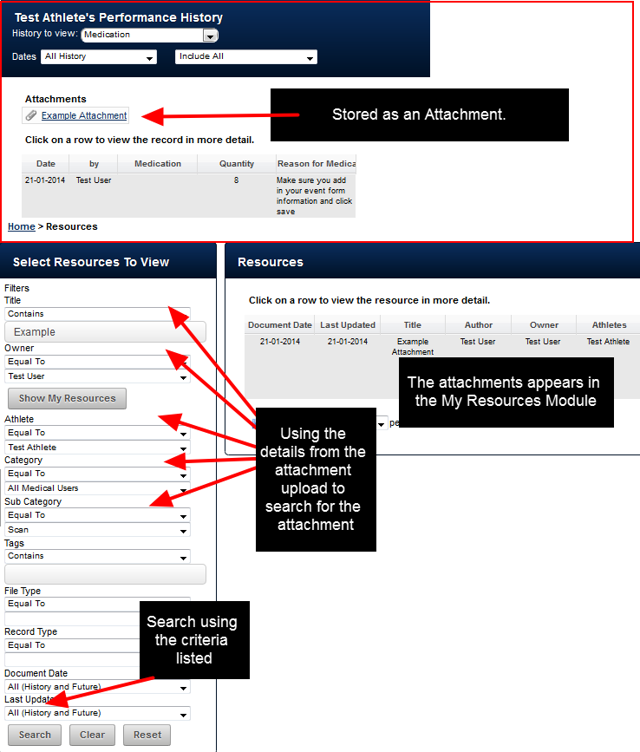 The example here shows that this user has been given access to the Category "Attachment" (on the Administration Site in the data permissions) and they can search for any Attachment Resources on the My Resources Module. This means they can access and search through attachments in that Category that they ALSO have access to the Event Form and the Athlete for. Therefore, the Medication Attachments are now all available here to access. 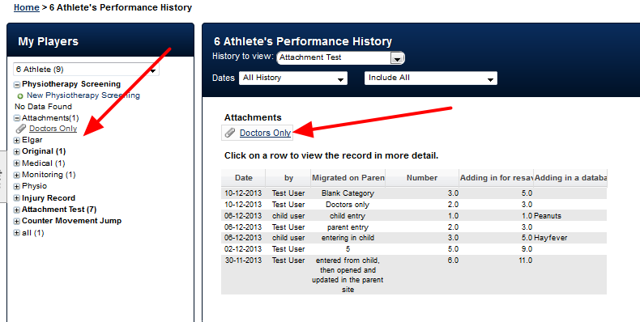 Moreover, you can search by athlete to see which attachments were uploaded on an athlete by athlete basis. N.B. Even if another is given access to the category called Attachment, they will NOT be able to access the Event Form Attachments unless they have access to the correct Form, and for the specific athlete the attachment was uploaded for (as outlined below). 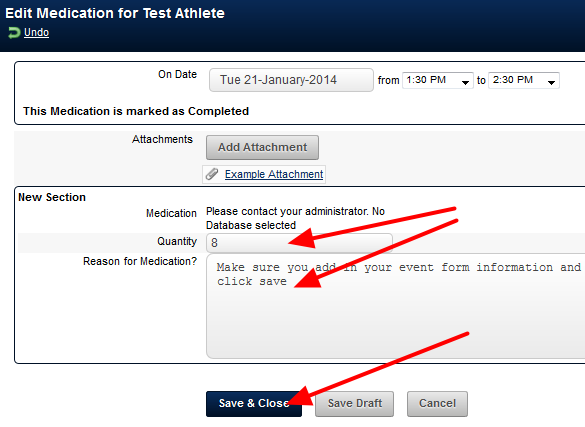 Enter an existing entry, or open an Event Form form for an athlete. If Attachments are enabled for this Event Form they appear at the top of the Page. N.B. 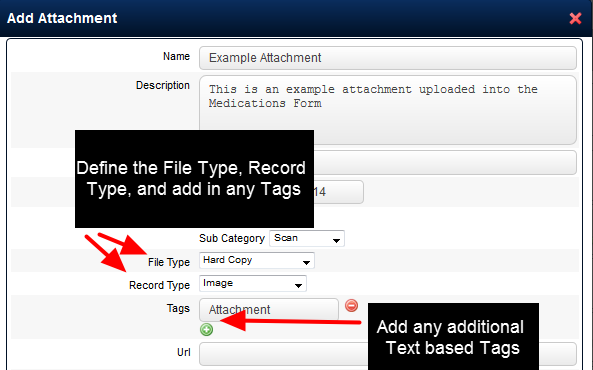 Any file uploads (in a table or as a stand alone filed) within the document are NOT treated as attachment Resources. ONLY attachments added via the Add Attachment button at the top of the Event Form will be available on the My Resources Module. These attachments will not be available in the My Resources Module, and they will not be added into any category to limit access. They will continue to function the same as before the update. Name the File and add in any Descriptions that you need. The Date will default to today's date. However, just click on it to select a different date (e.g maybe the date a scan was taken, or the date of a video). Now select a Category and the subcategory will appear for selection as well. Select the Category from the drop down list. Select a subcategory from the drop down list if one is available. You cannot save the Attachment to the Event Form unless you specify the Category that the attachments needs to be stored in. Tags (additional descriptors to help when searching for the attachment). 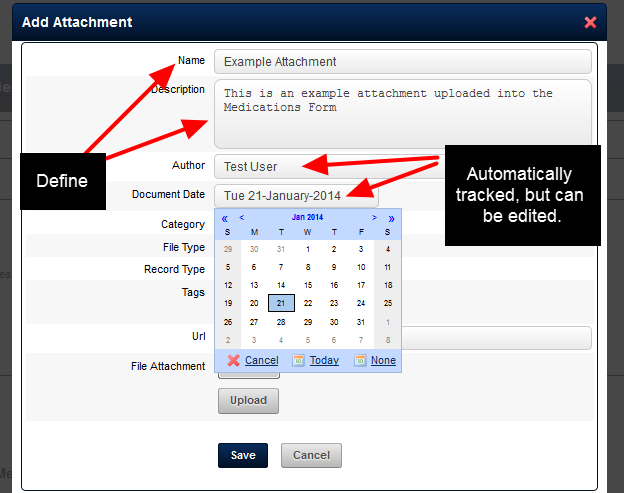 Attachment will automatically be added as a Tag. The image here shows that new attachments is stored as an Attachment on the Event Form. 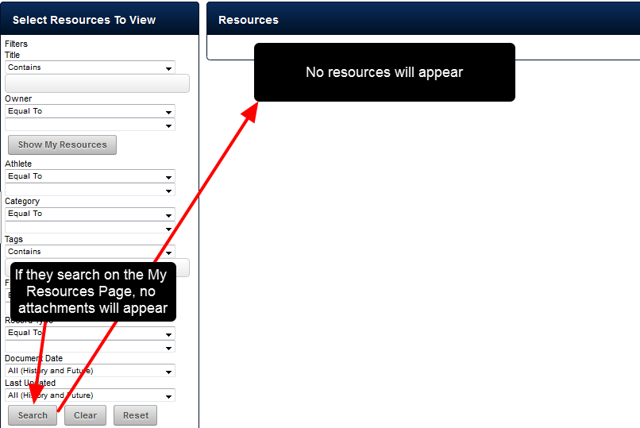 It is also available for selection on the My Resources Module. Keep in mind that you can use any of the search parameters to find the attachment again. The image shows that the name, file type. subcategory etc were used to locate the file. Alternatively, only the athlete's name or the date it was uploaded could have been used. The Attachment can also be opened and downloaded from the Event Form, as per the original work flow. 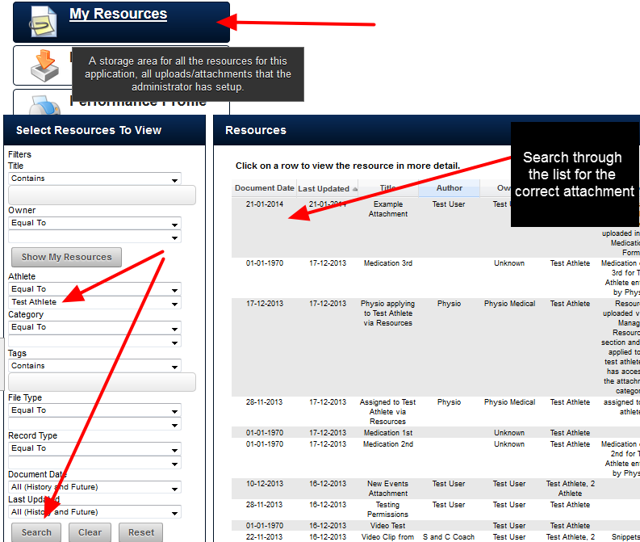 If you have access to the Manage Resources module you will also be able to edit the Attachment. Zoom: The Attachment can also be opened and downloaded from the Event Form, as per the original work flow. If you have access to the Manage Resources module you will also be able to edit the Attachment. 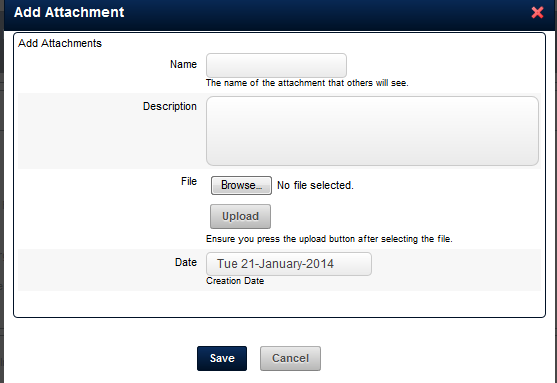 If you have access to the Manage Resources module then the normal attachments options appear. It can be downloaded, edited or deleted. If not, only the download option will appear. N.B. If you delete the attachment, it will be completely removed from the Event Form, the My Resources Module and the system. The example here shows that a Doctor's ONLY Category was set up by the system Administrator, and this Doctor has been given access to it. 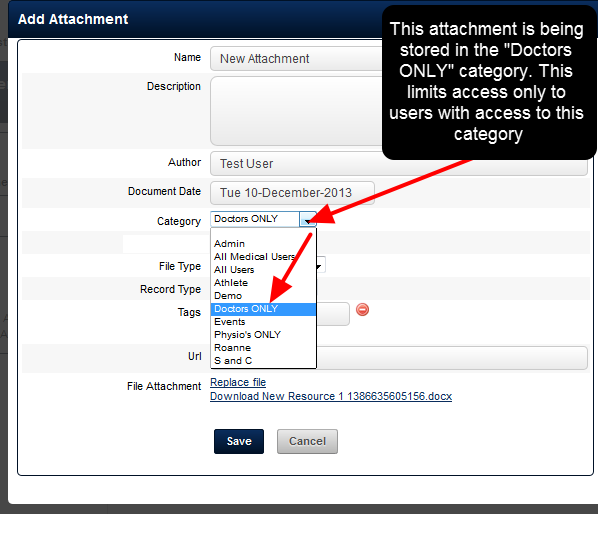 This means only users with access to the Doctors ONLY category will be able to access this file, and all other files added to this specific Category. The Doctor here attached the file to this form and stored it in the Doctors ONLY category. So any users without access to this category will NOT see or be able to access this Attachment. This is ideal for a confidential record, but if it was an MRI that Physio's also need to access, then they would not be able to access it. N.B.The categories that each user can see will vary depending on the category permissions, and the unique categories that your Administrator set up for your organisation. Your administrator will be able to provide more information on which categories you need to use to store documents. If in doubt, continue to use the "Attachments" category so that all user who can access this event form and athlete can access this attachment. 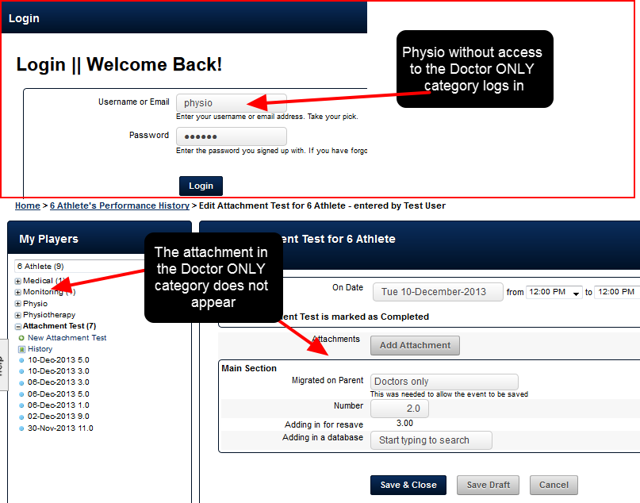 Even though the Physio has access to the Event Form AND the athlete, no attachment appears in the Event Form, or on the Sidebar for the attachment that was recently stored in the Doctor ONLY Category. This attachment will also NOT appear in the My Resources section for this Physiotherapy user. As an administrator,you need to ensure you create and then educate your users on which categories should be used depending on the type of document/s they are uploading. 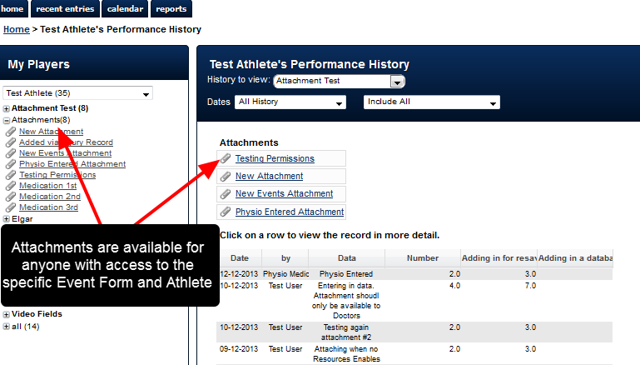 Remember that a user cannot access an attachment unless they have access to the Category, the Athlete AND the Event. This safeguards against a user being given access to category, but attachments stored for athletes or event forms that they cannot access still remain inaccessible. 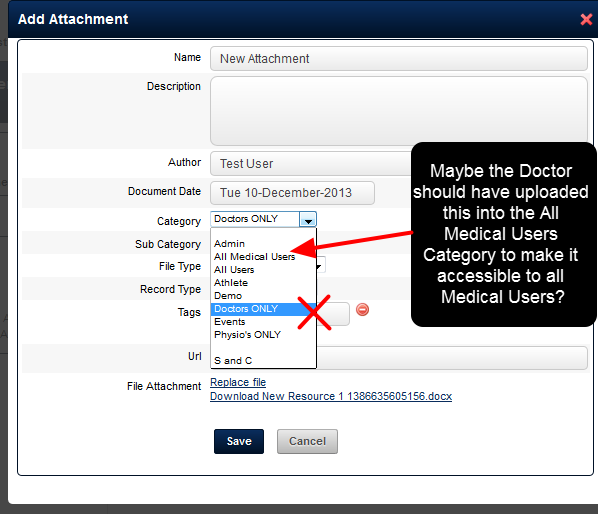 The example in the image here shows that Doctor could have used the "All Medical Users" category to store the attachment. This category had also been made available to Physio's and other Medical Staff via the Roles and the attachment will be available to them. N.B. No Attachments appearing in the My Resources Module, or in the Sidebar or Athlete History for Event Forms that have attachments? If you come to your My Resources page and NO resources appear when you click on "Search", OR, if no attachments appear in the Sidebar for the Events where you know Attachments should be then you have NOT be given permission to access the "Attachments" Category in your Role. Contact your system Administrator immediately and ask for access.